A print company’s success rests on its competitive advantages. Those advantages often result from integrating the right technology with smart business processes, excellent client relationships, and outstanding staff. Many print operations are now recognizing that RISO’s inkjet printers provide the right technology, at the right price to succeed in today’s short-run, customized, variable-data printing environment. RISO's ComColor series of production inkjet printers are built on the proven track record of its’ FORCEJET™ heavy-duty inkjet print heads capable of creating full-color variable images. High-volume production printers are most profitable when they are consistently batch processing long-run jobs that require minimal interaction during a run. However, batch data processing has evolved to include a growing percentage of short run, 24/7/365 processing. Personalized, data-driven, targeted mailings often need to take priority over large-quantity batch jobs. Problems with a high-volume job often require reprints of specific pages. Customers expect competitively priced, fast turn, work around with consistent print quality. Production managers look at this balancing act every day, all day, every shift. To meet customer expectations, successful printers must continually find ways to improve each stage of their operation. Problems arise when the printers become roadblocks to the company’s improvement objectives. Short run, high-value, time sensitive job environments require an innovative printer proposition. Given the realities of today’s environment, waste or loss of productivity in any phase of the print operation is not an option. Waste often arises during the job setup and preparation phases. These phases are where RISO technology excels. RISO’s ComColor series of inkjet engines provides a practical, cut-sheet approach to print that allows considerably more than “just” lightning fast production inkjet output. RISO’s easy-to-use customer interface and high-performance digital front end minimizes job set up for increased productivity and profitability of short-run work. In the time it takes to load, align, start, thread, and check a continuous feed printer, RISO’s simple to load, easy to run, no-heat, quick-dry color printer will be stacking finished output. With continuous feed presses, retrieving and handling the startup process paper waste is a productivity thief. RISO’s simple, easy load cut-sheet technology eliminates that productivity loss—without generating start up paper waste. 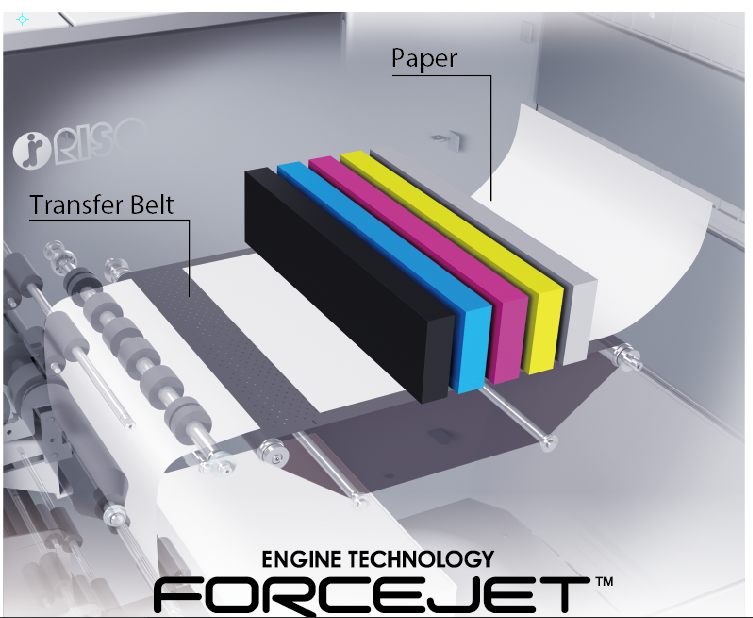 Throughout each production day, RISO FORCEJET technology improves overall productivity and minimizes paper waste, resulting in significant profit gains. RISO ComColor printers seamlessly step into the production workflow, processing common print language such as PDF and Postscript and smoothly turning the data into beautiful color output. A fundamental tenet of every business is to maximize revenue from every square inch of floor space. RISO’s ComColor GD printers are some of the smallest and fastest cut-sheet inkjet engines on the market providing maximum floor space revenue. A significantly less costly investment than competitive inkjet presses. A unique, instantaneously drying ink. And, RISO does that all that while using standard electrical power eliminating the cost of heavy-duty power lines. As a cost-effective, highly productive printer, the RISO inkjet printers give production environments a whole new set of tools to overcome production roadblocks. Rather than relying on one main production printer, print shops can invest in multiple RISO COMCOLOR GD printers to process multiple jobs simultaneously. RISO printers are designed with simplicity in mind to meet the reality of today’s short-run, cost-conscious business environment. Configurable engines for when-needed speed and throughput increases. Clean sheet, cut sheet production. No wasted setup time, no wasted setup paper. Innovative pigment inks dry instantaneously without heat. No need for warm-up to obtain the best print quality. Operators print precisely what is needed for every job. Preprinted shells are eliminated for simpler inventory management. With RISO printers, production managers eliminate wasted time that results from equipment unavailability by having the right machine to quickly and efficiently handle unexpected jobs and opportunities. Designed to complement existing pressroom configurations and processes, RISO has one of the smallest footprints in the production cutsheet inkjet market. RISO’s smartly engineered printing technology is straightforward and easy to maintain. The maintenance support model can be tailored to fit each customer’s operation. Companies can use their in-house service technicians, or work with RISO for an all-inclusive service agreement. Being able to react quickly and effectively when opportunity knocks is critical to business success. One significant opportunity that RISO technology delivers is fast, focused installation and transition to full production. RISO ComColor printers provide full-color inkjet output that ranges from 7,800 to 9,600 to 19,200 images per hour depending on the model. A smart, simple design technology requires less floor space, uses standard electrical connections and allows flexible configurations that can adapt to different production needs. Installing RISO ComColor technology can be the critical competitive differentiator in winning new, profitable inkjet clients. For a more in-depth read on how RISO is changing the color inkjet equation, request a free copy of the Breaking the Inkjet Barrier eBook.